You're a woman with hair that's one of a kind, so why would you settle for a curling iron that insists on giving you only one style? There's no such thing as "one size fits all" for hair, so you need a hair wand that can handle all of your hair needs. Give yourself more choice with the xtava 5 in 1 curling iron set kit, a curling iron that will simplify your life and keep your hair healthy and protected. Featuring 5 different interchangeable professional ceramic tourmaline barrels, you can customize your hairstyle every day with just 1 tool. Whether you're looking to create dramatic waves or loose curls, this set has it all. Use the classic 1 inch barrel with a clamp for traditional curls or define your look with smaller tapered barrels. No more pulling multiple curling wands out every time you want a new look--this curling wand lets you create fast styles without the hassle. Whether you have fine hair that refuses to hold a curl or coarse hair that needs that extra boost, this curling iron has 10 precise temperature settings to ensure that you are using the correct temperature to protect your hair and help keep it healthy. 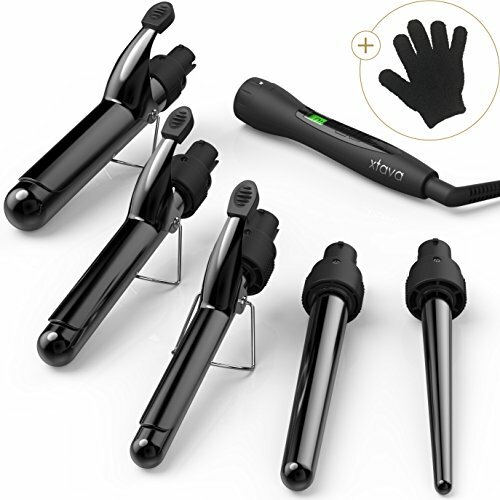 Xtava's 5 in 1 hair curler also offers you peace of mind, with quick heating technology, auto-shut off, a heat resistant glove, and universal dual voltage capability and a zip travel case for the on-to-go styling. No matter where you are in the world or what you're working with (Humid day? Your BFF's bathroom? Bring it on), we've got you covered with plenty of choices. If you have any questions about this product by xtava, contact us by completing and submitting the form below. If you are looking for a specif part number, please include it with your message.